Like a ’60s invasion, the G5422G-12 serves up full hollow-body build and the true Filter’Tron voice for that classically lush 12-string chime and jangle. 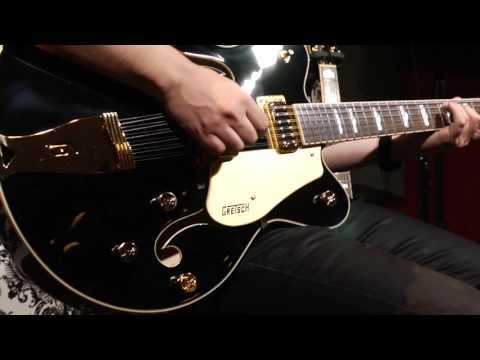 Like all Electromatic guitars, it delivers the fearless and electrifying authenticity that has set Gretsch apart as the quintessential rock ‘n’ roll guitars from the very beginning. It’s the sound of honor itself—play proud. Premium features include dual Black TopFilter'tron humbucking pickups, gold hardware, versatile upgraded controls including master volume treble bleed circuit, oversized bound F-holes and aged multi-ply body binding, smaller late-'50s G6120 bound headstock, Graph Tech NuBone nut, pearloid hump-hlock fingerboard inlays and a gold Gretsch G-cutout ailpiece.